When sixteen-year-old Tessa Gray crosses the ocean to find her brother, her destination is England, the time is the reign of Queen Victoria, and something terrifying is waiting for her in London's Downworld, where vampires, warlocks and other supernatural folk stalk the gas lit streets. Only the Shadowhunters, warriors dedicated to ridding the world of demons, keep order amidst the chaos. #2 “Remember when you tried to convince me to feed a poultry pie to the mallards in the park to see if you could breed a race of cannibal ducks?" This week's Memory Lane Monday is Clockwork Angel by Cassandra Clare. 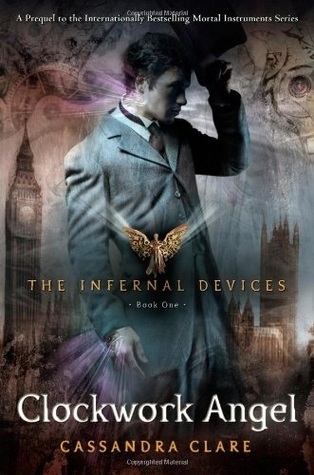 This book is the first instalment in the Infernal Devices trilogy set before the events of The Mortal Instruments. While I was roaming my bookshelf for a book to feature this week, my eyes connected with this book and I was like, "Oh my bookworm! How have I not featured Clockwork Angel yet *face palm*?! I am a HUGE Mortal Instruments fan, but let me tell ya, Cassandra Clare does a mighty fine job of making you really confused on which one you like better. What do I love about this book? *laughs* What DON'T I like? Seriously, this book is pure awesome-sauce! There's a strong, loveable heroine named Tessa, two hot British (What? Did I say British? ....Why yes I did ;) boys, an agonizing love triangle, and a super addicting plot! I think what also makes this book so special is the connections you are able to make between this prequel series, and the Mortal Instruments. Well that's all for this week ! I thought I'd spare you guys from the longer Memory Lane Mondays I've been doing lately :P Have you read Clockwork Angel? Do you like it better than the Mortal Instruments? Team Jem or Team Will? *cough cough* Team Will right? ;) Be sure to let me know in the comments! See you next Monday! Happy Thanksgiving to all of my fellow Canadians out there!